I first heard the remarkable voice of Aeone on a soundtrack a few years ago. The music and vocals were enough to spur me into finding more of her music and I have never been disappointed. She gifts us today with the extraordinary album titled Love Is the Healer. It has been a while since I have heard an album that has touched so deeply. Her voice is nothing short of angelic and her compositions rapturous. Together with her co-producer and collaborator, Jeff Silverman, she has created an album of Celtic/ World Fusion/New Age music that is...sublime. Every song is like a prayer, an entreaty to the Gods that they help in healing physical wounds and the mend the spiritual breaks. Run Home is a strong ballad about returning to where your life started. It may be a journey across miles of rocky landscape, glimmering ocean weaves or even glistening stars. We yearn to be safe, and to be remembered. Slap guitar, layers and layers of evocative vocals, and a bold melody set this in motion to this amazing journey. 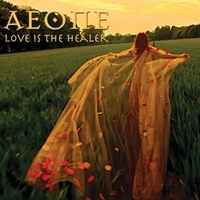 The title tune, Love is the Healer contains some superb harmonies. Beautiful voice-overs, a memorable melody and a bass driven theme combine to form a song that is softer than a prayer, louder than thunder and more reverent than a sacrifice. The lyric was amazing and once heard, unforgettable. We all want the same things in life, peace, health, security. Here is the invocation. And call across the great divide." I have heard many wonderful versions of the old English tune Scarborough Fair, (Simon & Garfunkel, Heidi Breyer, Sarah Brightman), but never as a dark exploit. Nothing evil here, but the sound is deliberate, haunting and memorable. The lady may not be as pure as we think. It makes me wonder if the tasks are indeed, possible. Although the song dates back to 1650, the percussion and tempo are purely contemporary. Salty, sun spangled waves, skies bluer than heaven and angels that lift you in so many ways is the next theme. Boat of Angels is my favorite song on the album, although it is difficult to choose one song over another. Never has there been a more balanced collaboration between east and west. With the musical talents of Grammy Award Winner Ricky Kej seamlessly blending with Aeone's, the tune becomes a mode of transportation known only to the soul. Aeone's lyrics rise like gossamer to the firmament. In Your boat of Angels." Light the Sky is a simple intonation to celebrate life. No real words in this one, but the vocalize is sweet and poignant. I choose to mention it because of its complexity in where the harmonies blend like echoes in a canyon. They reverberate over and over themselves making them into layers of spirited bliss. If this be magik, I fancy more. The poetry of She Walks With Me (Remastered) is inspired, the music breathtaking. The song is taken from her previous release, Point of Faith, and it is a story song. Lovers, meeting under the silvery moon, satisfy their desires, but is she real or a dream? Is she some manifestation of Aine, Goddess of love or merely his desire? Rich harmonies and lush music blend in this enthralling Celtic tale. The tenth and final song on Love is the Healer is the prayer Kyrie. Taken from the Latin liturgy it is the ultimate plea for spiritual forgiveness. The word is repeated many times in different harmonies and with varied emphasis, but the message is clearly the same, "Lord have mercy." The album is about things that grow, thrive and exist and all for the sake of life and what happens when something goes wrong. Aeone has, using many methods and many voices, spoken for those with no voice to call upon the God they love and ask for help in healing broken bodies and shattered spirits. It is something that is often needed in this life when we get to a point where we feel our bodies have betrayed us and our faith has been thoroughly shaken. This is inspirational music on levels unseen, but known to exist in our very souls.